Can We Trust that Health is Safeguarded as Part of Investment Negotiations? The recent leaks of TTIP materials have changed discussions on TTIP with claims that the agreement is dead. However, this does not imply that there would be no more interest in negotiations on investment liberalisation and protection as investment protection will be on the agenda of EU-Canada agreement (CETA)as well as FTAs with other countries. The focus has also been on US stances, but it is clear that a critical look should be cast on what Commission has promised and delivered in the TTIP negotiations as actual EU stances. This is particularly important for European Parliament oversight as what might be assumed to be excluded under services trade, may in fact be included under investment chapter. Furthermore, as key aspects related to “mixity” of trade agreements remain discussed in connection with in-direct investment, it is thus important that European Parliament scrutiny and focus on negotiations is not relaxed under assumption of the fall of TTIP. The current European Commission approach to investment as part of the new generation trade agreements suffers from major problems, which have not been addressed so far. The comparison between the agreements negotiated between European Union and Canada, European Union and Singapore as well as what is proposed in TTIP and CETA give insight on where priorities in trade negotiations do reside. In contrast to relying on assurances, statements and letters by Commission, European Union Member States and in particular, European Parliament, should look at what actually has been negotiated and proposed by the European Union. It is now known that US will be unlikely to accept investment courts. However, the problem is deeper in the negotiation strategy as lack of focus on health or consideration of policy implications for public policies remains evident also in EU own proposals. While European citizens have been asked to trust on Commission and Member States to negotiate agreements, which will not compromise health systems and social security, the reality so far falls short of this aim. In this paper the focus is on general textual parts where responsibility is mostly with Commission. Unfortunately what is promised has not been delivered and there remains substantial room for improvement. European Commission has also some explanation to do in terms of why European Unions’ own proposals have compromised so much in the sensitive areas of health services and social security. While European Member States have learned that health and social services have been excluded from trade negotiations and that these will not affect services excluded by Member States, this is not the case for investment. Investment liberalization is expanded to cover all services if these are already in the country as part of EU-Singapore Free Trade Agreement and the TTIP agreement. This is clearly a European Commission policy preference. While establishment to a Member State can remain excluded, most Member States do not have restrictions to establishment in practice and issues arise more often in the context of operational national treatment with respect to foreign investors, which are already in the country. Furthermore, operational aspects of national treatment are put under obligations from investment protection in the EU own TTIP proposal giving foreign investors the right to take governments to ISDS/investment court system if these national treatment obligations are breached, for example, through measures, which worsen foreign investors competitive position, in comparison to national providers and investors. While governments may still assume that their health services are “fully” excluded from the agreement, this is not the case on the basis of what European Commission has proposed as part of negotiations. This situation has been created by shifting investment liberalization into investment chapter and then splitting national treatment obligations for investment into two paragraphs. The separation of establishment and operation of an investment is then followed on in the exceptions article, where in the EU TTIP proposal only Article X Paragraph 1 of national treatment concerning establishment is excluded from national treatment obligations, while this is not the case for paragraph 2 concerning ”operation” of investment. As sub-paragraphs (a) and (b) apply to existing measures and measures compliant with the Agreement, it is now implied that only such measures can be taken, which do not cause loss or damage to investments made. This makes it harder for governments to retract from markets to public services, shift funding or enhance contracts to non-profit organisations. It is effectively shifting normal risk of investors to governments and limiting scope for going back from existing markets, if there remain substantial investor interests against this. This is a somewhat deceitful political choice for the European Commission as in contrast to Singapore and TTIP proposals, national treatment of investments has been fully excluded from investment liberalization in the CETA Agreement. It is difficult to foresee that Singapore would have been a tougher negotiation partner or that in its negotiation offer EU would not have wanted to ensure policy space, which has been emphasised in a number of public statements. It is clear that European Union did not want to exclude health, social, education and cultural services as fully as has been done for audiovisual services. As investment negotiations have become separated from services negotiations, this has become reflected in a change in tactics, where negotiators do not seem to understand what the word NO implies. If services have been put in Annex II this should imply that ANY measures, including those which are not in investor interest, are possible. The division of national treatment obligations in two parts is a problematic political choice as it stamps right to the centre of government capacities to regulate their health systems, yet formal exchanges seek to give an illusion that governments have a full right to exclude what they wish as part of their services schedule. While governments may still have the right to restrict establishment of new services in the country, this is not sufficient to provide policy space for regulation within countries as it would not be very feasible to restrict foreign investment to health sector. It is important to note that health systems or medicines are not excluded from investment protection provisions. These apply and will be applied to all services. It is also important to note that the definition of covered investment extends to investments “made in accordance with applicable laws, whether made before or after the entry into force of this Agreement”. It thus extends to all investments already made within a country. It also covers intellectual property rights. The European Union new proposals both for TTIP and CETA thus allow claims for compensation on the basis of breaches of investment chapter articles. A shift of emphasis on right to regulate to the actual text rather than preambular provisions has been made. This is good, but not sufficient. The key concern with respect to investment protection is not related to right to regulate as such, but how governments can regulate and whither and on what basis corporations can take claims to ISDS/ICS. The new Commission proposal makes it very clear that provisions do not apply to subsidies and state aid, which can be withdrawn. This is a clear reference to the so called Micula-case, which applied to regional subsidies. However, no explicit exclusion is made otherwise. It could have been done, but the European Commission choose not to do so. Furthermore, the choice was to add a necessity test to frame right to regulate in the TTIP proposal. While right to regulate provisions in latest CETA revision do not have necessity test or umbrella clause, which would cover government contracts, umbrella clause was included in the EU TTIP offer already before this was discussed with USA. The new CETA version emphasising right to regulate, however, is very weak as it merely reaffirms the right to regulate to achieve legitimate policy objectives. As investment protection is not about whither governments can regulate, but in terms of how they regulate and what kind of implications this has for investor interest. First, it opens up the potential to challenges that regulatory measures are not necessary, thus not carving out right to regulate, but requiring that it is shown to be necessary. Rather than safeguarding the right to regulate, it reduces this to an exception, where governments are required to prove that it is necessary. Second, it leads to a situation, where external arbitration panels /courts/tribunals may end up deciding whither regulatory measures are to be considered as necessary. It thus opens up in effect arbitration as a potential means to “limit” the right to regulate and for corporations to challenge particular approaches chosen by governments, if other more corporate friendly approaches to the problem can be envisaged to solve the problem. Third, the addition of the word necessary is clearly a choice by the European Commission. It is a political choice. This political choice thus prioritizes trade and investor rights in comparison to other policy priorities. It is premised on prioritisation of least trade restrictive or least investor interest affecting measures. The emphasis on legitimate policy aims thus hides the fact that means towards these legitimate ends are not at all safeguarded. There is no doubt that many health policy measures could become challenged as not necessary, in particular, when these affect or restrict key corporate interests, for example, in food, pharmaceutical, alcohol, beverages markets, and other areas, where public policy issues are discussed. Pharmaceutical policies are an area where commercial and public policy interests will differ and where regulators, public funders and authorities can take decisions, which can have direct and substantial implications to investors. The first relates to trade agreements. Governments introducing measures to protect the health of their citizens are being taken to court, and challenged in litigation. This is dangerous. Investor-State claims on the basis of direct or indirect expropriation have not been moved from the Commission TTIP investment protection proposal even though there is no ISDS, but an Investment Court System (ICS) is proposed. The same applies to CETA. While the form may have been changed towards a more permanent court in the TTIP proposal, nothing in the agreement limits what can be brought to arbitration. In Article 5 on expropriation in the new Commission proposal for TTIP, government measures are restricted in terms of direct or indirect expropriation, “except for public purpose, under due process of law, in a non-discriminatory manner, AND against payment of prompt, adequate and effective compensation”. This implies that scope for compensation claims remains also for non-discriminatory measures and in-direct expropriation. The new system is likely to offer some improvements from the past, but the real question is that investment court or not, it still gives scope for corporations to shift important public policy matters to a separate system. It is also important to note that while focus is on TTIP, it is known that investment protection in CETA would provide a way to take claims further to a large number of US industries. While ISDS/ICS clause in CETA and TTIP has specific paragraph emphasising that protection of non-discriminatory public health, safety, environment and social and consumer protection, this leaves unclear how investment protection requirements relate to government measures to contain costs or to limit profiteering, and whither cost-containment in publicly funded services could be considered as a public welfare or social protection objective. This is important as in particular with publicly funded services concerns over profiteering, tax-management and use of low paid and zero hours contracts have resulted in criticism against practices of commercial service provider organisations in United Kingdom, Sweden and Finland. Furthermore, there is a risk that through arbitration process and claims, decisions on what can be considered as public welfare objectives, would be shifted to arbitration court. The challenge of addressing pharmaceutical policies and pricing is not tackled in the European Commission CETA or TTIP versions on investment protection either. Interestingly, the TPP investment protection clause has made specific reference to pharmaceutical policies as public health policies. If we consider investment protection as a means to protect existing investor rights and privileges it is important to link this to such areas, where there are direct conflicts of interests between health and commercial policies. One crucial area is pharmaceuticals as government decisions on approval of new medicines are of major importance to R&D based companies. At the same time criticism over very high prices of new medicines as well as profiteering in the field are raising concerns across the Atlantic, in particular, in the light of Dutch Presidency concern over antimicrobial resistance, prices and innovation of new medicines in spring 2016. It is also possible that investment protection is more important for pharmaceutical industry than strengthening further intellectual property rights (IPR) provisions, due to the anticipation of pressures to lower prices. Furthermore, promises of innovation have not become realised and with increasing public funding for research on new medicines governments may find out that they may be paying twice for new medicines, first through public financing to R&D, and then through exclusivity. It is important to note in this context that the IPR –related exclusions are narrow in this context. There is already a case on medicines under investment protection (Eli Lilly vs Canada) . Brook Baker has criticized this claimand, in particular, the understanding of legitimate expectation in the claim. In the light of what European Commission proposes in TTIP, it is not at all confirmed that this type of claims could not be made under the proposed mechanism. Concerns over pharmaceutical issues can also be seen in the specific emphasis of pharmaceuticals as public health in TPP carve out (see below). The relationship with taxation is to be addressed as a general issue under denial of benefits in the EU TTIP proposal for investment protection. While a more general exclusion for tax measures is likely to emerge elsewhere, this would require an explicit elaboration due to the current magnitude of tax management practices. This is a matter of relevance for pharmaceutical policies as it is known that, for example, Pfizer investment in Ireland was closely associated with tax management practices. While Australia prevailed in the most notorious case on Philip Morris against Australia, the issue is that this case should never have gone to investment arbitration in the first place. On the other hand, arguments that there have been also favourable judgements to governments do not make investment arbitration as appropriate forum for decision-making on public health and policy matters. We should ask why only tobacco for carve out? If tobacco requires a specific carve out, why have all other public interest purposes and environmental regulatory aims been left out in the cold? Why carve out only the simplest public health concern and leave everything else in? The explicit reference to pharmaceutical policies as part of public health measures does confirm that governments have foreseen potential problems in pharmaceutical policies in the context of TPP. However, the problematic aspects of the investment section extend beyond indirect expropriation as, for example, minimum standard provisions for fair and equitable treatment are as likely to give ground for claims. The lists of requirements with respect to fair and equitable treatment may seem strict, however, the list ends with “or”. This implies that one broader or looser requirement is enough. In contrast to a reference to legitimate expectations in CETA, in TTIP the European Commission own new proposal has open ended scope depending on decision powers of a trade committee. However, this gives false safety as it is likely that the same people, who had negotiated the unfortunate deals, would populate the committee with free prospects to expand what could be considered under fair and equitable treatment. Furthermore, while the most favoured nation (MFN) clause seems to exclude ISDS, it does not exclude other aspects of investment liberalisation and protection. If it remains applicable to fair and equitable treatment and transfer provisions it could open scope for utilising these from other agreements. European Union is committed to ensure high level of health protection in all policies under TFEU 168. This has not realised in investment protection. We have already ISDS cases on health services, medicines, health protection and health promotion. Furthermore, there are increasing concerns with respect to investment protection clauses and pharmaceutical policies. Health systems spend substantial resources and decisions on pharmaceutical reimbursement and marketing approvals, which can have substantial economic consequences for investors. The role of investment protection may at this point be particularly important for pharmaceutical industry as governments have increasing pressures to lower costs of pharmaceuticals. European Union Member States are responsible for financing of their health care systems. However, there is risk that trade negotiators do not have sufficient understanding and clarity of what kind of measures and issues are of importance for regulation and cost-containment within health systems at national level. At the same time health-care related industries will have an interest to promote internal markets and trade negotiations as the key framework for regulation and standardization in the field and to secure investment protection as broadly as possible. When investment chapters in CETA, EU-Singapore Treaty and TTIP (EU proposal) are compared, it has unfortunately become increasingly clear that European Commission representing EU in trade negotiations may not have been as keen on making real carve outs or changes as public statements would imply, but seeks to make minor decorative changes, which are useful for assurance, but not sufficient as remedy or reform. While some changes may seem substantial in the arbitration world, these are not sufficient in terms of fully safeguard legitimate public policies. When EU proposal for TTIP is compared with US TPP investment chapter, both are guilty of “spinguards” and decorative assurances. As benefits of investment protection to consumers, citizens and public interest remains poorly articulated, the negotiation documents remain unbalanced when assessed from the perspective of broader public policy-making. The danger is that as result of a negotiation “compromise” a marriage with greatest benefits to strongest transatlantic interest groups will be made and then sold to the rest of the world as an improvement, while undermining multilateral negotiations on the matter through other multilateral fora. A more fundamental concern is that new negotiations would actually legitimate investment arbitration as part of public policies and “standard practice” more broadly as well as result in a shift of power from public courts to private arbitration. It is thus important that European Parliament is not charmed by minor reform proposals and that it maintains full scrutiny of what is and what will be negotiated under investment chapters, in particular with respect to public interest and common concerns across Member States in the fields of health, environmental sustainability, social security and pensions. The problem of market access relates to policy space, relevance for other obligations and restrictions to impose quotas. 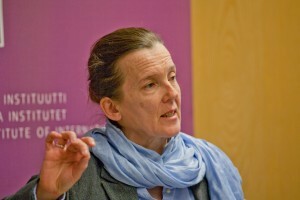 *Meri Koivusalo is a senior researcher in National Institute for Health and Welfare in Finland. She is a medical doctor with a PhD in public health and MSc in environmental health policy. Professor Koivusalo has written and published on international and European health policies, including on trade and health. She has followed trade policy developments for more than 15 years, and has served as an advisor for Finnish Ministry of Social Affairs and Health as well as for European Commission DGV, DG VIII and WHO. Meri Koivusalo was a member of the WHO Consultative expert group on research and development: financing and coordination (CEWG).